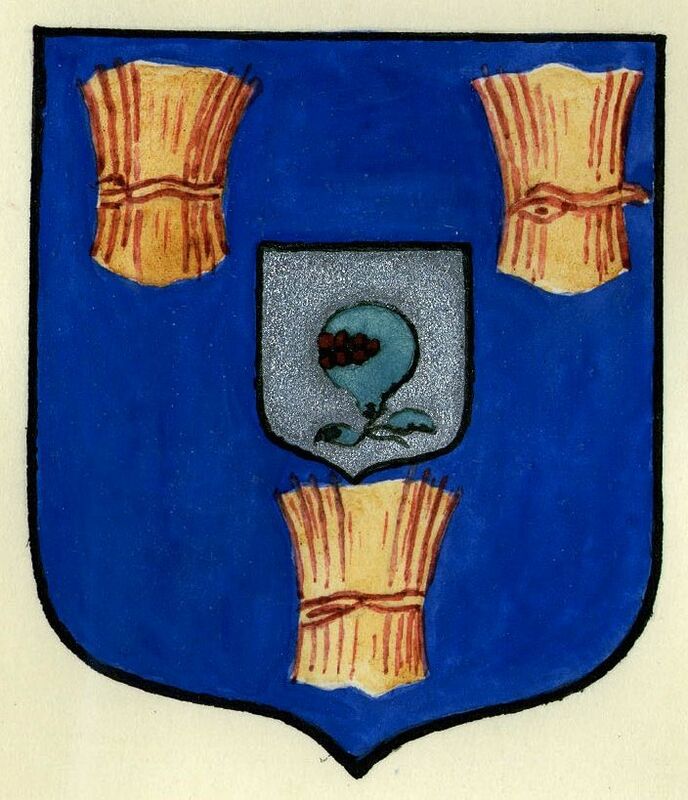 I translate the blazon as: Azure three garbs or on an inescutcheon argent a pomegranate slipped and leaved vert. Nicaise Ladam (born in Bethune 1465, died at Arras in 1547) was Herald, then King of Arms of the Hapsburg Emperors. He composed a French verse Chronique relating events at the Burgundian court between 1488 and 1546. Does anyone know why the Burgundian King of Arms should have used the pomegranate as his title and badge? Just speculating, but the pomegranate was a royal/imperial badge of the House of Habsburg, a reference to the Kingdom of Granada. Although a long way from Burgundy, there was a lot of cross-fertilization of emblems across the Habsburg domains, witness the use of the Burgundian ragged saltire in Spanish military colors. I suspect that a better translation of the title might be "Grenada King of Arms," for which the pomegranate is a canting device. This is what comes of posting before morning coffee! Of course Ladam wasn't a Burgundian KofA he was a Habsburg KofA. His master, Charles V, Holy Roman Emperor, was born in Burgundian Flanders and inherited the Netherlands (which included much of the northern Burgundian inheritance) in 1506. The title "Granada (or Grenada)" King of Arms is thus not so odd as Charles was King of Spain from 1516. That Ladam's title was linked to Granada did not, I imagine, exclude him from serving in the Netherlands any more than Norroy and Ulster is precluded from having his base in London. and indeed Granada features on the list. Interestingly Azure three garbs or were the arms of the Earls of Chester, and Chester Herald's badge is a crowned garb. So there is an unusual link between Habsburg and English heraldry. Then it would seem that this was a Spanish king of arms, perhaps having authority in the Burgundian realms. While they were ruled by the dukes of that house those lands included large slices of north-eastern France, but also incorporated the Low Countries (at least until the Dutch revolt). I recall reading of an officer of arms of a Duke of Burgundy styled Luxembourg King of Arms. We think in terms of nations - Spanish, English, Burgundian - but my impression is that the professional heralds were primarily dynastic (royal, ducsl, etc.) officials - more like personal heralds of a particular king, Duke, etc. Some were given titles reflecting a badge (still the case for some of the English heralds & pursuivants), others the names of various territories held or claimed by their master. Symbolically the titles of a given king's or archduke's several heralds served much the same political and public relations purpose as the various quarterings or badges representing those several holdings or claims - advertising their dynastic holdings and powerful status - whether or not each individual practiced primarily or solely within the local jurisdiction or inheritance corresponding to their heraldic title, just as their master's multi-quartered arms would generally be used through out their various domains to represent the wonderfulness of their dynastic ruler's collective Empire rather than promoting separate local identity.